The Coushatta Casino Resort is located in Kinder Louisiana and is Louisiana’s premier casino resort featuring a 100,000 square foot gaming floor, over 500 hotel rooms, six restaurants, and live entertainment venues. Coushatta wanted an eye-catching centerpiece for the gaming floor to attract the attention of their guests. In consultation with Alpha Video, Coushatta decided to focus attention on a win-a-car slot machine bank. Alpha Video designed, engineered, and installed a unique configuration of 14-slot machines to grab the guests’ attention and promote the opportunity to win a new car. 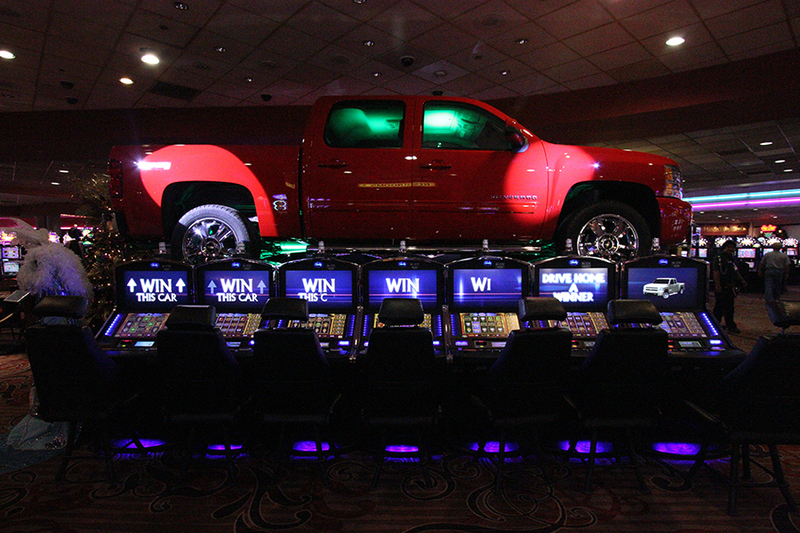 The slot machines are in two back-to-back rows of seven machines with the vehicle to be given away sitting on the top of the slot bank. Each slot machine includes an upper video screen which normally operates independently and displays pay-out tables and messages that promote the slot machine game. Alpha Video designed the system and Alpha Video Creative designed content so that the motion graphics runs across the seven side-by-side upper screens. 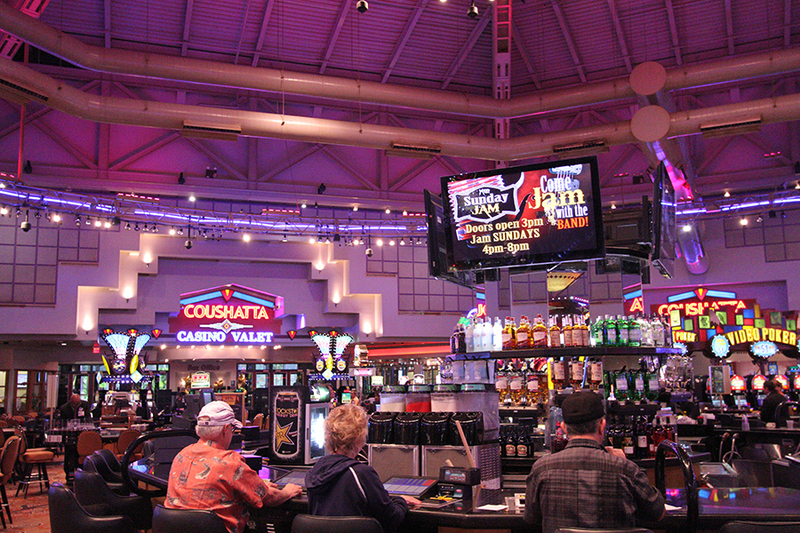 Another major objective for the digital signage at Coushatta was to build excitement and enhance the feeling of winning on the gaming floor. This is accomplished by displaying jackpot winners, progressive odometers, and most importantly, jackpot celebrations. Jackpot celebrations show high energy animations that take control of both the displays on the property and the house audio system to announce when a person wins a jackpot. The CastNET software is also used by Coushatta to design and schedule content for the Coushatta Information Channel that runs in the hotel rooms. This channel provides information to hotel guests about the casino, restaurants, and entertainment venues. 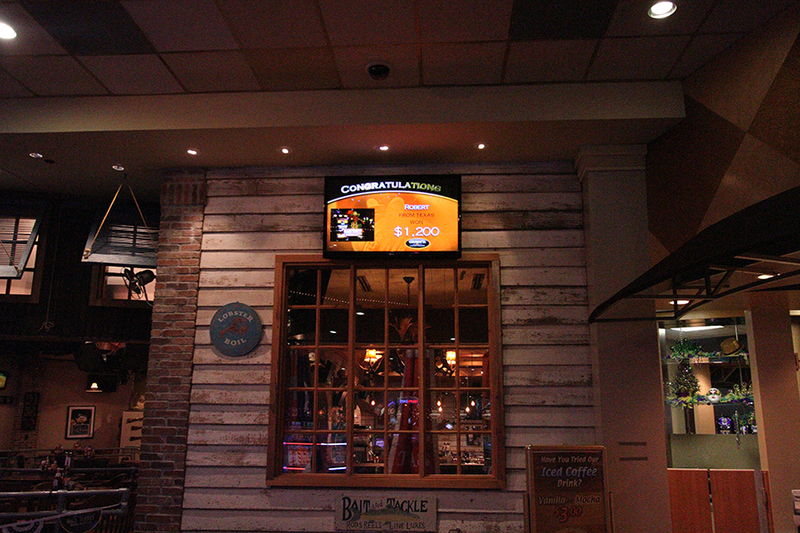 An IPTV system was deployed by Alpha Video to stream content to the screens throughout the property. The IPTV system allowed Coushatta the flexibility to use CastNET to assign any one of the content channels to any of the screens on the property. In addition to the CastNET content channels, the property can also assign an assortment of television channels to any of the screens. All of the channel changing is done through the CastNET interface. Daily revenue is up since the installation of CastNET, along with an increase in revenue from the win-a-car, slot machine bank. Customer satisfaction has also increased due to more effective communications about what is available for the guest to do while on the property.